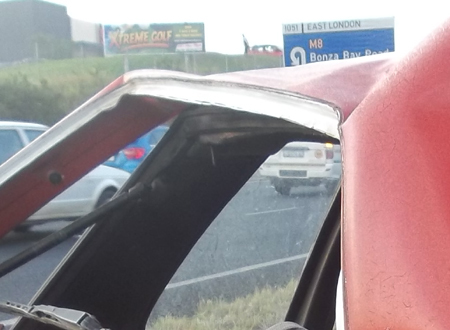 We had a nasty car accident in East London two days ago. What happened, car accident photos, and the situation we are now in. 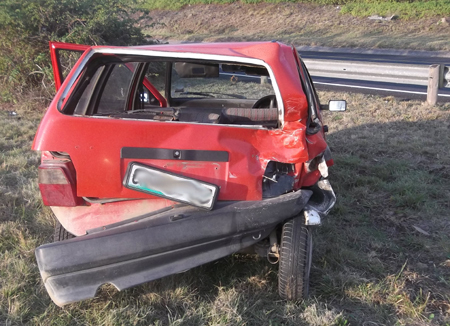 Another vehicle smashed into the back of our car on the N2 near the Beacon Bay offramp. I guess this sounds like just another not too serious car accident in East London. I’d like to tell you, why, for Tony and I anyway, it’s not just another not too serious car accident in East London. 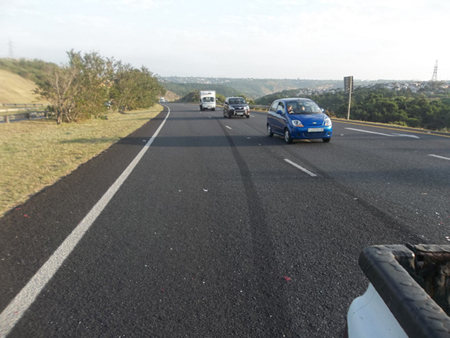 It was about 4pm on Monday the 15th of July 2013 that we driving slowly along the N2 behind a slow-moving truck. and were heading out to the Brakfontein and Lilyfontein area to fetch my two teenage sons from school and to take them to their twice-weekly evening karate class back in East London. About 30 minutes before the car accident we had just faxed proof of payment of R300, and our application form, to the 2013 Christmas in July in Hogsback organizers to book our craft market stand space for this weekend. We had also arranged with my mother’s once-a-week gardener to arrive the next day to help us, this time, not on his gardening day, with the preparation of our products for the Christmas in July craft market. 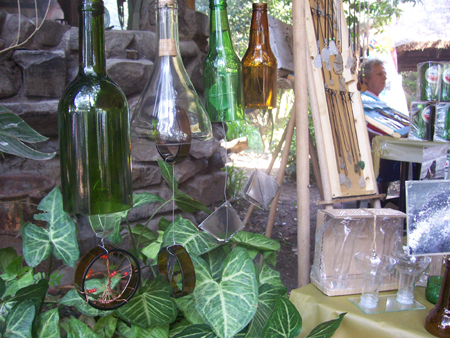 This Christmas in July craft market trip to Hogsback was going to be our first attempt at selling our products at a craft market that lasted for more than just one morning. We haven’t been making and selling our craft market products for all that long. We were hopeful about this 2013 Christmas in July Hogsback festival trip this weekend, and were looking forward to it. We were driving along in the slow lane of the N2 leaving East London, approaching the Beacon Bay offramp with the Xtreme Golf in Beacon Bay mini golf or putt putt course on our left (but we were going straight on towards the Gonubie turnoff), stuck behind a slow moving truck, but not minding travelling slowly and had no intention of yet trying to overtake the slow moving truck when we could see in the review mirrors that there was a lot of traffic behind us, when WHAM! we were hit from behind. I can’t remember in which order but there was a lot of skidding noise behind me, a big WHAM! and a lot of metal scraping noise everywhere. I think I remember thinking “Okay, so this is what being in an accident feels like and sounds like – it’s happening – we’re actually having an accident.” I lost control of the car. 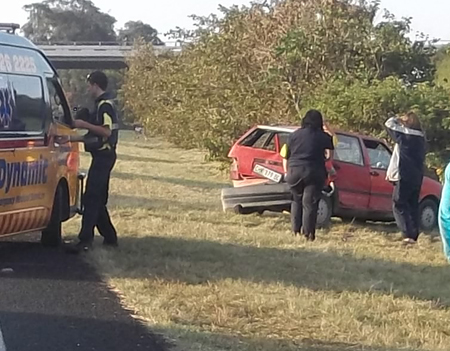 Went left, and then to the right across the lanes and ended up in the centre grass verge of the N2. This was my first major car accident and maybe it was too many movies or something, but all I wanted to do was get out of the car in case it exploded. 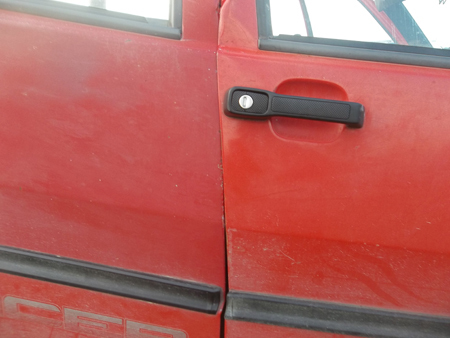 I couldn’t open my drivers side car door. I panicked and tried to kick the door open. The car door wouldn’t budge. I remember saying “I want to get out; I want to get out” and Tony said “Come out my door.” So I did, shaking. One shoe was on, one was not. The sunglasses I’d been wearing were on the back seat. The back of my right foot was bleeding, but not much. Tony was okay. I was okay. How often will I see my boys if they now have to spend more time at their father? If either of us had been seriously injured in the accident, we don’t have medical aid – we cannot afford it. I have spent about R22 000 on a car that isn’t mine – R10 000 to my father for use of his car when I separated from my now-ex-husband nearly 6 years ago, and, along with my two sons, moved in with my parents – no car, and no job at the time. The uno is old and has needed various repairs, part replacements, new tyres, new battery, and maintenance services over the past 6 years, costing me a further R12 000. With no job, when divorce payment came through, there wasn’t enough over to get a car after paying everyone I owed money to, and after paying for some basic and needed living expenses items. I was allowed to continue using my father’s car. Tony and I don’t have a steady income. Even though we have quite a few happy clients, work is often quiet, and our freelance services don’t bring in all that much money. In fact, some months are a struggle. We cannot yet afford to move out of my parent’s home as the rent my parents charge is cheaper than everywhere else. We cannot buy another car, even a R5 000 car, if any of those even happen to exist. We cannot afford one of those “No deposit R699 a month cars” either – we looked into that earlier this year, even spoke to one of the people at the place over the phone about it – for even just that R699 per month car, due to the distance we travel each month not being enough, we’d need: car insurance, R2 200 for the first month, and R1 100 per month after that – if they even approved us in the first place, with no steady income and only bank statements to prove our up-and-down income. 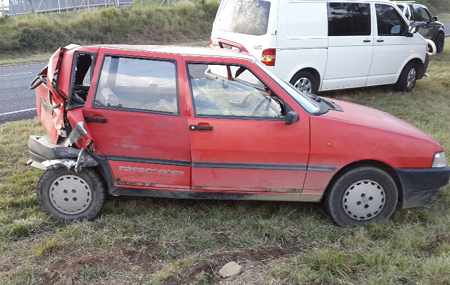 All we can manage is maybe R500 a month for another car – and that would be without car insurance. We cannot get a loan without also having a steady income. We are freelancers. There are some loan places that may be able to help freelances, but not usually for more than R8 000 or so, and it needs to be paid back within 33 days or so. We need to find a person or people – and soon – who can loan us about R12 000 to R15 000 – call it R15 000 that we can use to get another car. And not just that, but a person or people who will allow us to pay the money back at a rate of only R500 a month, for 30 months. Why not just wait for the insurance to pay out and get another car with that money? Due to the age and value of the car, it is likely that the insurance payout won’t be much. Even if it is enough, my father has not yet decided if he will even get another car with the money (or put it towards getting another car.) Even if he does get another car, it will still be his car that I will be using, and paying the repairs of – another bout of paying for a car that isn’t mine. I need my own car. If I don’t have a car at all, I cannot take my teenage sons to school and back, and they will need to spend more nights at their father for the sake of school trips, when I am their primary custodian and already, as it is, I don’t like them spending any nights away from me. 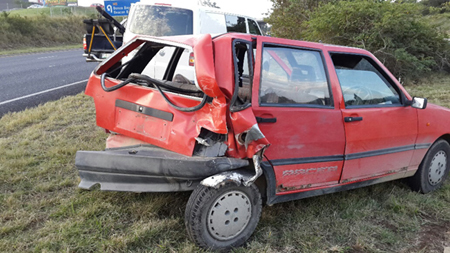 I have also always been very nervous about my children travelling in a vehicle that is not being driven by me, – and will be even more so now after our accident, and there are not many Lilyfontein parents that live in Cambridge anyway, to consider a lift club. The school bus is not an option either. There is no discount allowed for more than one child of the same family (so it would work out more expensive than taking them to school and back myself) and I’d still have to get my children to where the school town bus leaves from, about 8km from where we live, and would have to fetch them there again late in the afternoons after school sport. Also, the school bus is not going to take them to their karate lessons in town two evenings a week. I cannot accept that I will just have no transport and move my teenage sons to another school within walking distance. They have been at Lilyfontein since the age of 3 and are doing well there – in fact my eldest son has been first in class every year since grade 1 – Lilyfontein school is where they belong. A temporary solution is that I have the use of a wonderful and helpful friend’s bakkie for two weeks – so we can still go to the 2013 Christmas in July in Hogsback festival this weekend, and can still take my boys to school and back for the next two weeks. A long term solution is that I need my own car, soon. Ahead of that, I need R15 000 to buy that car when I find it. I think I need to approach friends and ask them if they know anybody who may be happy to loan me R15 000 that I will take 30 months to pay back. So there you have it: why, for Tony and I, this accident was not just another not too serious car accident in East London. Happy to be alive and well, but need to face some difficulties ahead. We’d like to thank everyone for their concern at the scene of the accident, and for messages afterwards, my brother for coming to my rescue yet again, and my friend for the use of her vehicle for two weeks. Thank you to you all.